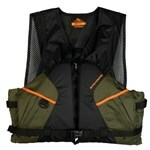 The vest has two front pockets for easy access to tackle and other gear. This US Coast Guard-approved life vest features mesh on the back and shoulders for added ventilation. The other highlights includes zipper front, adjustable waist belt for custom fit and large arm holes to make paddling, casting or aiming easier. Comfort Series™ Fishing Vest Features: Approval: Comfortable Mesh Shoulders, USCG Type II, Adult Life Vest, 200D Nylon Shell, Weight Capacity : 90 lbs & Over, PE Foam, Webbed Buckled Strap, Front Zipper, Pockets: Two Front Pockets"